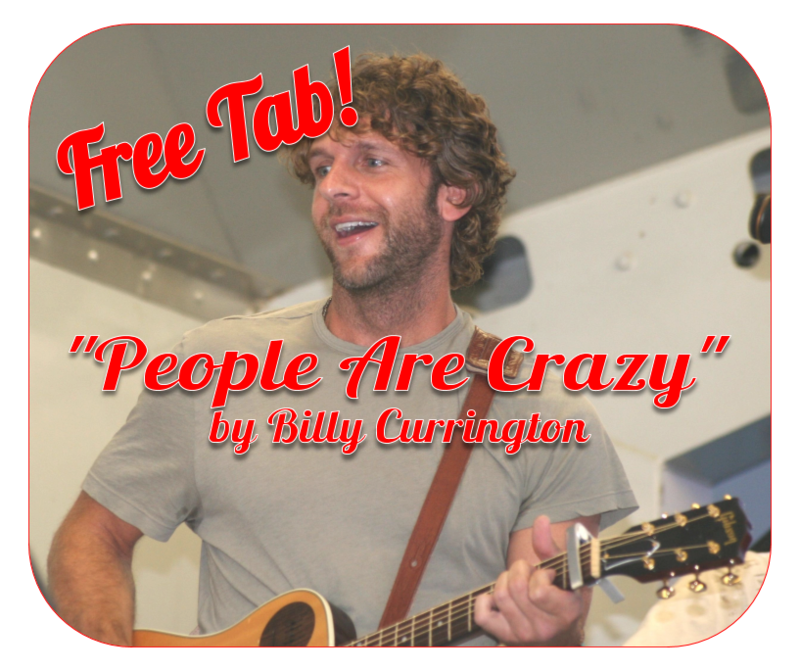 Learn how to play People Are Crazy, as performed by Billy Currington, on your 3-string cigar box guitar with the free tablature in this post. Putting electronic components into a cigar box guitar, and getting everything properly wired and connected, can be a daunting task for the first-timer – but it doesn’t have to be. In this article we will present several basic wiring diagrams created by Ted Crocker, and discuss each of them in some detail to help you understand what is going on. Don’t forget that you can get most of the parts shown in this article, including piezos , jacks, volume potentiometers and potentiometer knobs , right in our C. B. Gitty Crafter Supply Web Store! 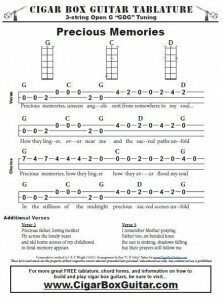 The tablature in the PDF link below will show you exactly how to play the melody and chords for the well-known Christian hymn Precious Memories. 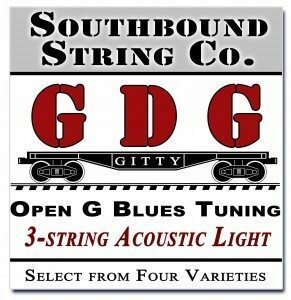 This song has been recorded by a number of big-name artists, from Johnny Cash to Pete Seeger, Emmy Lou Harris to Bob Dylan, Alan Jackson and more. It has a nice easy melody line and chord progression. We include the melody line, chord accompaniment, additional verses and also the chord form diagrams on this printable sheet, so you should have everything you need to play this great old hymn. Pat MacDonald originally took the name Purgatory Hill as a solo artist, before using it for the hypnotic, hard-edged duo he formed with singer/songwriter melaniejane. 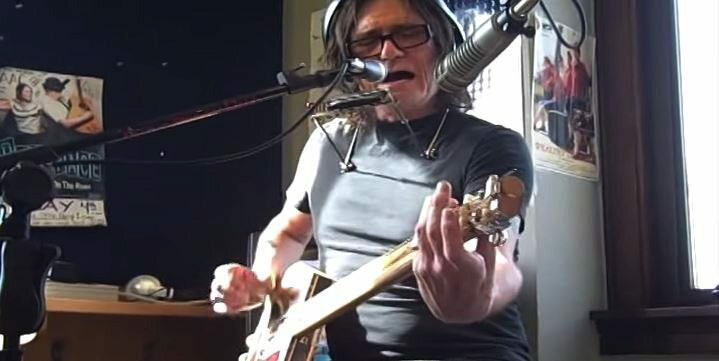 A long time performing artist, who as one half of the band Timbuk3 was nominated in 1987 for a Grammy as Best New Artist, Pat has deep roots in the recording industry. He is an acclaimed songwriter who has collaborated on songs with artists like Cher, Keith Urban, and Peter Frampton. Pat also has credits on songs performed by artists Aerosmith, Night Ranger, and Billy Ray Cyrus to name a few. One night after Pat’s performance, a fan handed a cigar box guitar to him and told Pat to keep it. The cigar box guitar was a Lowebow, the brainchild of artists John Lowe and Richard Johnston. That guitar helped to shape the direction Pat moved in the music he created. The Lowebow, which in its early inceptions was given the name Purgatory Hill Harp, has one bass string and three guitar strings which enable Pat to get the deep, growling sound he is fond of. His knack for playing dark, thumping grooves made possible by this CBG, were fitting music for his poetry. Much like the deep drones of Mississippi Hill country music that seem to influence Pat’s style, the cigar box guitar gave Pat a medium through which to express his dark art. From the name of his newfound instrument, and with John Lowe’s blessing, Pat took the name Purgatory Hill. Pat then teamed up with melaniejane who plays electric cello, accordion, percussion, and sings to complement Pat’s own talents. Along with melaniejane the Wisconsin musical duo tours and records, receiving national press coverage for their craft.